Whether you’re traveling to the island of Oahu in Hawaii for a vacation or lucky enough to be PCS’ing there, you won’t run out of things to do! 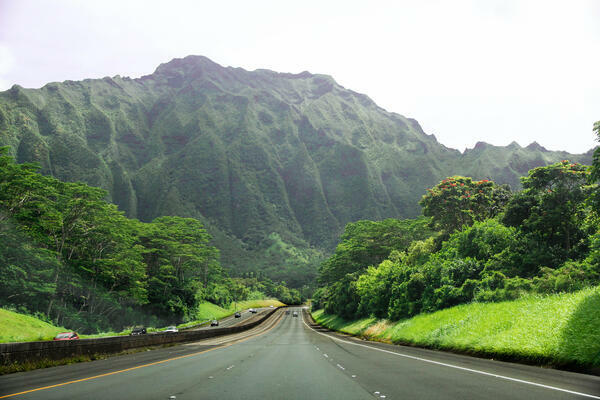 While most visitors are aware of the typical tourist destinations of Waikiki, Honolulu, Pearl Harbor, and Dole Plantation (all worthwhile sights to see, by the way! ), I’d encourage you to get off the beaten path a little and experience all this beautiful island has to offer. Foodie, shopper, surfer, or outdoors type? There’s something for everyone! Since there’s no possible way to do Oahu justice or give an exhaustive list of everything you could possibly see in one short blog post, consider this a starting point for your own travel adventures, culled from some of our family’s favorites after being stationed in Hawaii for several years. While many military will make use of the popular Hale Koa hotel, an Armed Forces Recreation Center resort hotel in Waikiki, make plans to venture out from crowded Waikiki Beach and head to the well-known North Shore, which is a 45-60 minute drive depending on time of day. It’s most crowded in the winter months during peak wave/surfing season, but well worth the drive. Sunset Beach, Banzai Pipeline, famous Waimea Bay, and Sharks Cove are all on the northern part of the island. 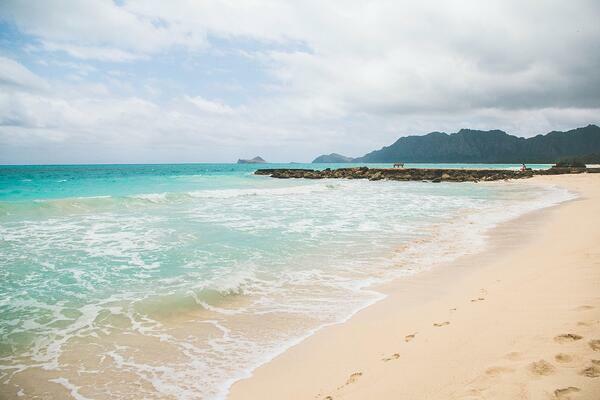 One of our favorite spots is Ehukai Beach (i.e. the Banzai Pipeline). Parking is limited, especially during the busy winter season, so arrive early and if you don’t arrive early, be patient! Many cars park along the shoulder, which is legal as long as you’re not blocking a driveway or by a no parking sign. Be mindful of the fact that the road servicing the North Shore is a two-lane road and can get quite backed up. Slow down, enjoy the scenery, and above all, don’t honk. Honking your horn is considered quite rude by locals and will surely flag you as a tourist. Drive with Aloha! Before leaving North Shore, be sure to stop by Haleiwa Town for some shopping, local shave ice, seafood, or other yummies from a variety of food trucks and restaurants. Our favorite shave ice comes from Haleiwa’s Aloha General Store. Bellows Beach, called one of the most beautiful beaches in the world on many travel reviews, is on the windward side of the island and boasts a pristine beach, gorgeous mountain views, and the famous clear blue water. Bellows Air Station, open to military ID holders and their guests, offers several lodging choices: campgrounds, rustic cabins, regular cabins, and even new rooms for rent. Availability is limited, so check well in advance. Even if you’re not able to score a room there, make plans to spend the day at Bellows. Sea turtle sightings are common and it’s a great place for families and small children. There are several military camping areas and beaches on the island, including Pyramid Rock Beach at KMCB (Kaneohe Marine Corps Base), or “K-Bay” as it’s referred to, which also offers cottages for rent. Leonard’s Bakery: Sample a malasada (Portuguese donut brought to the area by immigrants in the 1800s). Cinnamon’s Restaurant: delicious breakfasts in Kailua, family style. Try the red velvet pancakes! Nico’s Pier 38 is a popular spot for fresh seafood. Began as a gourmet plate lunch place, now a full service restaurant. Ted’s Bakery in Sunset Beach is legendary for fresh pies. Pies from Ted's are also sold in some of the military commissaries on the island. A towering piece of Hula Pie from Duke's Waikiki is worth experiencing at least once! Aiea Bowl is a bit out of the way and doesn't look like much from the outside. We're so happy we discovered it after seeing it featured on Food Network's Diners, Drive-Ins, and Dives. I can vouch for the "Tasty Chicken" and garlic fries! Food trucks abound and if you happen to be in Hawaii on the last Friday of a month, check out "Eat the Street" for wonderful fare from local vendors at Kaka’ako Gateway Park off of Ala Moana Blvd. and Cooke St. There are a multitude of companies offering packages for deep-sea fishing, parasailing, whale watching, scuba diving, helicopter tours, and other activities. While I'm sure you'll want to snorkel at the famous--and beautiful--Hanauma Bay, here are a few other activities we recommend! Macadamia Nut Farm: To me, this is a don't-miss activity. The Tropical Farms/Macadamia Nut Farm Outlet offers a gift shop and samples of coffee and macadamia nuts, but the real draw here is the tours. Equal parts hilarious and informative, guides in native dress take you on a bus tour through the property and show you how to weave flowers and shave fresh coconut you've cracked open yourself. A great family outing! Kuuloa Ranch: a little further up the road from the MacNut Farm, you might recognize this site as a location for movie and TV sets (Jurassic Park, Lost, 50 First Dates, among others). The windward side of the island is simply breathtaking. Aloha Stadium Swap Meet: open 3 days a week, Hawaii's largest flea market offers deals on treasures from local merchants. 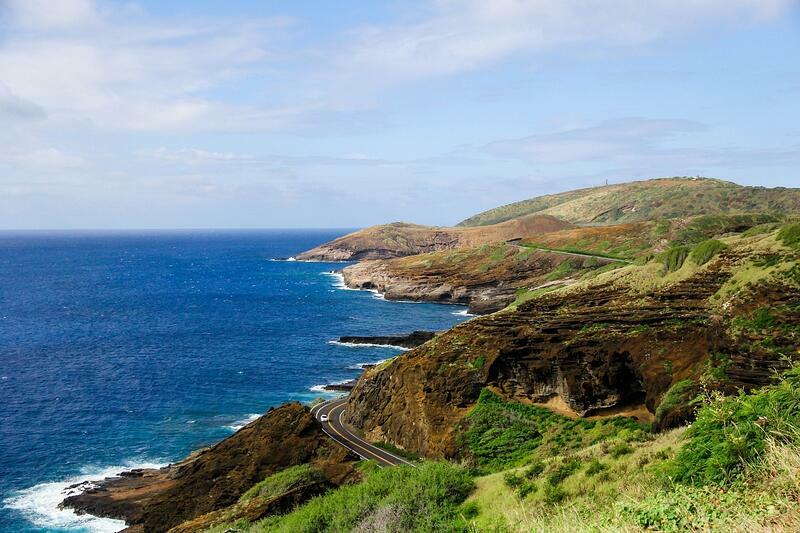 Drive across the H3 that cuts across the center of the island and take in the stunning views. Stop at the Pali lookout for photo opportunities and more views. Koko Head Crater Trail: steep climb up old railroad ties--1,048 of them to be exact; spectacular view at the top is worth the effort! Manoa Falls: can be muddy, but gorgeous and unique; fairly short and not too strenuous. Aiea Loop Trail: usually cooler walk through the mountains with less climbing, amazing view of H3. Maunawili Falls: be prepared to get dirty! Nice hike, swimming hole, and falls. Kaena Point: westernmost tip of Oahu. Dramatic shoreline hike culminating in a nature preserve where you may see albatrosses and monk seals. Ka'au Crater: recommend only for serious hikers. All-day hike with several waterfalls and great views from rim of the crater. My avid hiker husband says this was his favorite hike on the island! I've barely scratched the surface of the island of Oahu has to offer. Be sure and comment your "must-sees"!